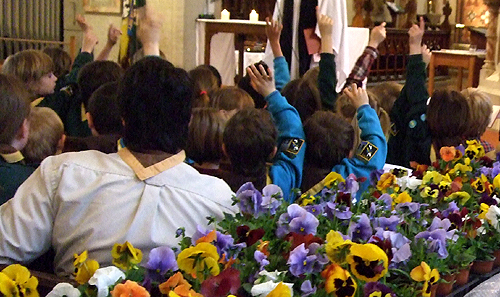 Mothering Sunday, Laetare Sunday, is the fourth Sunday of the season of Lent. Laetare is a Latin word from laetari, to rejoice and is a time for children to say thank you to their mothers for looking after them. They give them presents, flowers, and cards as tokens of their love. Mothering Sunday used to be called 'Refreshment Sunday', reminding us of the time when the forty days of Lent were strictly kept and Refreshment Sunday was a day to relax from fasting. Also the day was called Refreshment Sunday because many churches traditionally read about Jesus feeding the five thousand. It became a time for family reunions and gatherings as many Christians remembered Jesus' own mother, Mary. Now modern Mothering Sunday gives us a lighter moment in the midst of the restrained and serious feel of the season of Lent. 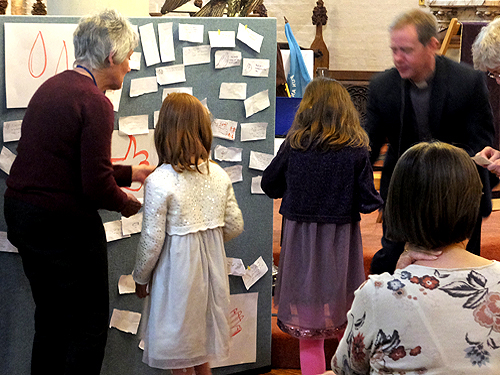 St James's celebrates Mothering Sunday with a special family service, the All Age Service. St James's Players accompany the hymns and play other music during the service. 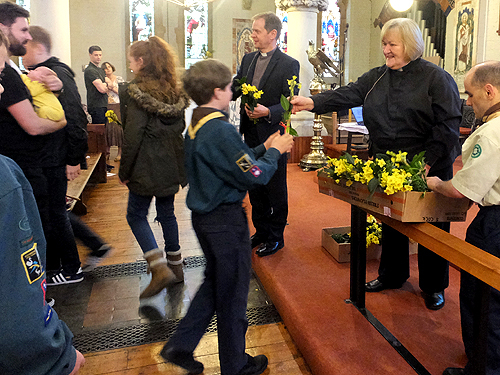 The uniformed groups join the service and participate by carrying their flags in a colourful parade through the church and, with the Sunday School, often help during the service or at the parish breakfast. Flowers are prepared for every young (and not so young) female to take home as a sign of love and thanks. We also pray for mothers and families. The origin of Mothering Sunday is uncertain, but during the sixteenth century it was when people returned to their mother church for a special service. The mother church was either a large local church, or more often the nearest cathedral. In later times, when children reached adolescence (sometimes even before) they were sent away to service as housemaids or boot boys. So it became a day when these domestic servants were given a day off, to visit their mothers and other family members. It was often the only time that whole families could gather together. The children often had to walk several miles before they reached their mothers and on their way they would pick flowers, violets or primroses as a token of love. The custom became known as 'going-a-mothering' and gave rise to the saying 'He who goes a Mothering, finds violets in the lane'. Simnel cake was another traditional gift. The word Simnel is said to come from the word simila the latin for wheat flour, but the cake consisted of far more than flour. In shape it was rather like a pork pie and its contents resembled those of a rich plum pudding. A delightful old legend says that the name Simnel came from the names of a happy couple who baked such a cake; their names were Simon and Ellen and their abbreviated names SIM and NEL were put together.